Hailing from California, Nathaniel Crosby was an All-American golfer with the University of Miami's Men's Golf Team. 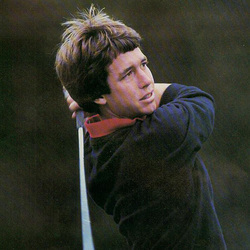 Perhaps his most important achievement occurred in 1981, during the fall semester of his junior year, as he stunned the experts by winning the United States Amateur, the most prestigious amateur golf tournament in the world. He won in a sudden death playoff by sinking a 20 foot birdie putt on the first playoff hole. At 19 years and 10 months old, he was the 3rd youngest player to win that event. Following that win, Nathaniel was chosen as the Florida Sports Writers Amateur Athlete of the Year as well as Northern California's Athlete of the Year. In 1982, the Men's Golf team was selected to represent the Southeast Region III at the NCAA Championships, held at Pinehurst, NC, and UM finished 10th. In addition to his studies and participation on the UM Men's Golf Team, Nathaniel was invited to play in the Masters Tournament in Augusta, Georgia, and other prestigious golf tournaments as a result of his U.S. Amateur win. He has also served as Chairman of the Bing Crosby Pro-Am Golf Tournament Crosby graduated with a degree in Politics and Public Administration from UM in 1982.